PHILADELPHIA, PA– Despite a season-high 38 points from Vander Blue, the South Bay Lakers fell to the Delaware 87ers, 127-123, on Tuesday morning. The Lakers (12-5) forced 22 turnovers but shot only 33.3% from beyond the arc in the loss. Delaware (5-12) was led by James Blackmon Jr., who came off the bench to score 27 points on 6-9 from three as the 87ers grabbed the wire-to-wire victory. Delaware jumped out to a quick start and led by as many as 13 in the first, but the Lakers rode an 11-0 run to end the quarter to lessen the deficit to two, 29-27, through one. Devin Robinson paced the Sevens with seven points while Blue and Scott Machado combined for 12 points to keep the Lakers close. Robinson scored 10 more in the second as Delaware extended their lead to 60-54 by halftime. Blue scored nine points in the third, but Christian Wood had 10 points of his own to extend the Delaware lead to 92-83 through three. Blue erupted for 22 points in the fourth quarter alone and Ivica Zubac added 12 points, but the rest of the team couldn’t get it going as Delaware held on for the win. The 87ers shot 51.2% from the field as seven played scored in double digits, led by Blackmon Jr.’s 27 points. Wood grabbed a double-double with 24 points and 14 rebounds, while Robinson scored 21 points and grabbed nine boards. Darin Johnson (17 points), Shawn Long (12 points, four rebounds) and James Webb III (11 points, nine rebounds) rounded out the scoring for Delaware. South Bay relied on Blue’s big scoring performance (38 points, two rebounds, two assists, three steals) to keep them in the game, but only had two other Lakers reach double figures: Machado (16 points, eight assists) and Zubac (26 points, 12 rebounds, three assists). Demarcus Holland had his best all-around game of the season with nine points and nine rebounds, while Alex Caruso stuffed the stat sheet as well (eight points, nine boards, seven steals), but the balance of Delaware proved to be too much. South Bay did convert all 18 of their free throws, the first time they didn’t miss from the charity stripe since March 23, 2010, when they hit 8-8 from the line. South Bay will now take on the Erie BayHawks in the first end of a back-to-back on Thursday, December 21 at 4:00 p.m. PST from the Erie Insurance Arena. NEWARK, Del. — The Delaware 87ers (2-8) threw shade at the Northern Arizona Suns (3-6) by a final score of 103-96 at the Bob Carpenter Center in Newark, Delaware. The Sevens earned their first home victory of the season and have now won two straight games. Delaware had a slim lead throughout most of the contest and used a 29-point fourth quarter to finish off Northern Arizona. Head Coach Eugene Burroughs was adamant before the game that his team’s biggest focus was defense. Burroughs relayed the idea that if the Sevens’ defense was up to snuff, the rest would take care of itself. He was spot on with his assessment. The 87ers played a ferocious brand of basketball from the jump, closing out on three-point shooters and hounding would-be drivers. Nothing came easy for the Suns tonight. Northern Arizona entered the game tops in the G League with an average of 15 makes from distance per game, but Delaware held the Suns to just 7-26 from beyond the arc. Northern Arizona also committed 20 turnovers and had only 14 assists on 35 made baskets. It’s a long road from G League draft pick to G League rotation player, but Darin Johnson is traveling it with aplomb. He’s slowly but surely upped his productivity as his opportunity to play has expanded and tonight was his best game as a pro. Johnson spent his 18 minutes racking up 13 points, four rebounds and a steal. He shot 6-9 from the field, had a highlight-reel dunk and played annoying defense throughout. Look for Johnson to remain a permanent fixture in the Sevens’ rotation if he keeps this up. Northern Arizona came into the game 3-5. The Suns three wins were by a combined 15 points, while their five losses were by a total of 14 points. Additionally, the team hadn’t played in a game where the margin of victory was greater than nine. The Sevens have had their share of late-game struggles in the past, but the team took a step forward this evening. Delaware won the fourth quarter 29-24, got big shots down the stretch from the likes of Devin Robinson, Furkan Korkmaz, Christian Wood and Jacob Pullen and maintained the same level of intensity on defense that it had early in the game. This was truly a team win. The Westchester Knicks (3-0), the official NBA G League affiliate of the New York Knickerbockers, finished its first road trip of the 2017-18 season with a dominating 117-90 win over the Delaware 87ers (0-3), the Philadelphia 76ers’ affiliate. Westchester heads into Friday’s home opener in Westchester undefeated. Knicks affiliate Nigel Hayes dropped a game-high 37 points in the contest, narrowly missing a double-double with nine rebounds and four assists. Knicks affiliate Trey Burke followed up his record-breaking 43-point performance in last night’s win with 19 points, eight assists, and four rebounds and steals. Fellow affiliate Xavier Rathan-Mayes also had 19 points, adding four each of rebounds, assists, and steals. Two-Way player Luke Kornet contributed 14 points, eight rebounds, and three blocks, while his counterpart Isaiah Hicks notched his second double-double in a row with 10 points and 12 rebounds to go with two steals and a block. Delaware had four Two-Way players on hand; two from Philadelphia and two from Washington. 76ers Two-Way player Jacob Pullen paced the Sevens with 18 points, four assists, and two steals while Emeka Okafor completed a double-double of 17 points and 11 rebounds. Wizards Two-Way player Mike Young came off the bench for 11 points and four rebounds, his Washington teammate Devin Robinson adding six points in eight minutes. The Knicks commanded the first quarter from the beginning, jumping out to a 12-0 start. The Sevens, struggling to find its shots, added insult to injury with seven turnovers in the first twelve minutes to the tune of 12 points. Though the home team managed just 14 points in the first, Delaware fared better in the latter part of the half with 26 second quarter points while holding Westchester to 24. Still, heavy damage was done, and the Knicks held a 22-point lead heading into the locker room. Down but not out, Delaware held it down in the third quarter with a 33-point showing, but Westchester answered back with 31 of its own. Unfortunately for the home team, its final quarter looked much like the first, and the Knicks ran up as much as a 32 point lead with Nigel Hayes combining for 19 points in the second half. The 117-90 final score in the under two-hour game put Westchester at 3-0 on the season while leaving Delaware winless. NEWARK, Delaware — The Westchester Knicks (2-0) emerged as the victors tonight in a hot and cold game with the Delaware 87ers (0-2), the Philadelphia 76ers’ affiliate. Down by as many as 16 points, the Knicks came back in a thrilling finish to win it all 113-111. Knicks affiliate player Trey Burke set a new franchise record for Westchester with a game-high 43 points, adding on six rebounds, three assists, and three steals. Fellow affiliate Nigel Hayes knocked in 22 points, notching a double-double with 11 rebounds. Two-Way player Isaiah Hicks also recorded a double-double, finishing with 15 points, 11 rebounds and an added two blocks. Luke Kornet, the Knicks’ second Two-Way player, contributed 13 points and seven rebounds while Knicks affiliate Xavier Rathan-Mayes supplied 10 points, seven rebounds, and three assists. Sixers Two-Way player Jacob Pullen led the Sevens with 24 points, four assists, and three rebounds; his Two-Way counterpart contributing 15 points, six rebounds, and three blocks. Fellow starter Furkan Korkmaz was just short of a double-double, finishing with 17 points and nine rebounds. Mike Young and Devin Robinson came off the bench with double-digits, Young with 19 and Robinson with 10. The teams were slow to start, with neither side breaking double-digit scoring until 6:50 through the first quarter. Only able to muster 17 points in the first twelve minutes, Westchester found itself down by 13 early in the second. Luckily for the visitors, Burke’s hot shooting picked up with the guard scoring 16 points in the second quarter alone. At the half, the Sevens’ lead was diminished, with the Knicks ahead by two. The third quarter looked much like the first, as Delaware regained its commanding lead by outscoring the Knicks 34-18. Down 14 points heading into the final quarter, Westchester used a 19-5 run to make a game of it once again. Tying it up 100-100 with 4:33 on the clock, the Knicks then faltered as the Sevens regained a quick six points. In a thrilling finish though, Westchester would come out victorious, the final score 113-111. NEWARK, Del. — The Delaware 87ers (26-22) topped the Greensboro Swarm (18-31) 123-114 in a must-win game that keeps the 87ers playoff hopes alive. Russ Smith led the way with a season-high 43 points as the Sevens topped the Swarm for the third time in four meetings this season.The game began as a battle of starting point guards, with Delaware’s Russ Smith and Greensboro’s Cat Barber trading blows in the early part of the first. Smith put up 10 of the Sevens’ first 12 points, while former 87er Barber scored 11 of the Swarm’s first 13 points. The first quarter stayed close and became a high-scoring affair, ending with the 87ers holding a 36-30 lead. The Sevens controlled the beginning of the second quarter, leaping out to a 41-32 lead before allowing an 8-0 run from the Swarm. The game was tied at 47 at the midway point of the second, but Delaware outscored Greensboro 18-8 the rest of the frame to take a 65-55 lead into the locker room. Russ Smith had 25 at halftime to lead all scorers. It didn’t take long for Russ Smith to reach the 30-point plateau. He scored the Sevens’ first five points of the third quarter within a minute to hit the mark. Delaware maintained its lead throughout the period, but Greensboro cut into their deficit by three across the third to make the score heading into the final quarter 91-84 in favor of Delaware. Greensboro scored the fourth’s first basket to bring them to within five points, but the 87ers responded with a 10-0 run to give themselves a bit of a cushion. Though the Swarm continued to make things interesting, Delaware kept them at bay. When the score was 102-95, Russ Smith ripped off eight unanswered to give the Sevens a 15-point lead. Greensboro proved a tough out, but Devondrick Walker’s three-ball with 18.8 seconds left iced the affair and gave Delaware a 123-114 win. The 87ers had five players finish in double figures. Russ Smith (43), Shane Edwards (18), Walker (13), Roscoe Smith (12) and Terrence Jennings (11) made up the group. Barber had 23 for Greensboro, which was led in scoring by former Kansas standout Perry Ellis, who dropped 25. Though the Sevens are alive in the playoff race, they have zero margin for error. They are two games back of the final playoff spot and must win their next two games and have fourth-place Maine lose its final two contests. The 87ers hold the tiebreakers with the Red Claws, who have lost three straight and finish the year with a road back-to-back. WILMINGTON, DE – MARCH 17, 2017, – The Delaware 87ers today announced the team will host Beau Biden Foundation Night on Saturday, March 25 when the Sevens host the Windy City Bulls at 7:00 p.m. Former Vice President of the United States Joe Biden is scheduled to be in attendance as the two organizations look to raise awareness for the Beau Biden Foundation for the Protection of Children. Vice President Biden is scheduled to address the crowd during a special halftime ceremony. Tickets are on sale now and can be purchased at SEVENS.COM, by calling 302-504-7587 or by visiting the Bob Carpenter Center box office. Admission starts at just $14 and portions of all sales will be donated to the Beau Biden Foundation. Sevens players will also wear custom Beau Biden Foundation uniforms designed by Unique Image, available to fans in a silent auction to benefit the organization. The Beau Biden Foundation for the Protection of Children continues Beau Biden’s commitment to protecting the most vulnerable among us, especially children who have fallen victim to abuse and neglect. The Foundation works to end child sexual abuse by effectively educating adults and children, developing the next generation of child welfare professionals and strengthening child protection laws around the country. The game on Beau Biden Foundation Night on March 25 is also scheduled to be broadcast live on The Comcast Network (TCN) and Facebook Live beginning at 7:00 p.m. Please visit SEVENS.COM for more information. The Beau Biden Foundation for the Protection of Children was established in June 2015 as an operating non-profit to continue Beau Biden’s commitment to protecting the most vulnerable among us, especially children who have fallen victim to abuse and neglect. We believe that no child should be threatened by a predator – either an adult or a peer. We believe that child abuse can be prevented through effectively educating adults and children, developing the next generation of child welfare professionals and strengthening child protection laws around the country. To learn more about the Foundation, visit www.beaubidenfoundation.org. Follow the Beau Biden Foundation on Facebook (facebook.com/BeauBidenFdn) and Twitter (@BeauBidenFdn). WILMINGTON, DE – FEBRUARY 8. 2017, – The Delaware 87ers today announced that the team has acquired NBA veteran and three-time NBA Slam Dunk Contest champion Nate Robinson. Robinson (5-9, 180) won NBA Slam Dunk Contests in 2006, 2009 and 2010. He has 618 NBA games on his resume, with career averages of 11 points, two rebounds, three assists and one steal per game across ten seasons with New York, Chicago, Boston, Denver, Golden State, Los Angeles Clippers, Oklahoma City and New Orleans. He most recently played in 2015-16 for Hapoel Tel Aviv of the Israeli Basketball Premier League, where he averaged 16 points, three assists, two rebounds and two steals per game. Robinson led the club to the playoffs, where he scored 46 points in a quarter finals matchup, which set a record for most points in a post-season game since 1985. A collegiate standout at Washington, Robinson was a two-time Pac-12 All-Tournament Team selection (2004, 2005), NABC All-American Third Team selection (2005), AP All-American Third Team selection (2005), Frances Pomeroy Naismith Award winner (2005), Great Alaska Shootout Most Outstanding Player (2005) and Pac-12 All-Freshman Team selection (2003). He averaged 14 points, four rebounds, three assists and two steals per game in his college career. NEWARK, DE – The Delaware 87ers (15-13) dropped their third straight game and second to the Grand Rapids Drive (13-16) this season. The final score was 116-105 in favor of the Drive, which knotted the season series at two games apiece. This was the final meeting of the year between the two teams. Shawn Long and James Webb III led the way for Delaware, with both notching double-doubles. Long finished with 31 points and 13 rebounds, his 12th double-double in the past 14 games. Webb III’s 13 and 12 gave him five-straight double-doubles. Russ Smith got the start, his first of this season for the Sevens. He had just three points, but did dish out 10 assists in 33 minutes. The two teams kept it close throughout the first three quarters. The Drive led by seven after one period and just one at halftime. The 87ers won a high-scoring third frame 34-32 to take an 84-83 lead into the fourth. Delaware kept pace with the Drive despite shooting just 6-33 from three-point land. The game remained close through the midway point of the fourth quarter. From there, the wheels came off. Both teams played sloppily late, but Grand Rapids capitalized on Delaware’s miscues, while the 87ers could not return the favor. “I think sometimes you have to play through that,” Burroughs said. “You always have spurts in games where it gets a little hectic, but sometimes I look at those opportunities as ways to get easy buckets. Delaware, playing without Cat Barber for the fifth-straight game, allowed 65 second-half points and lost the final period 33-21. Barber was sidelined with an ankle injury. The Drive had a monster game from downtown. Grand Rapids went 18-34 from distance, good for 53 percent. Five different players had multiple three-pointers and the team knocked down timely threes late in the game. Those assignment players were Henry Ellenson, Michael Gbinije and Darrun Hilliard. Ellenson and Gbinije were drafted by the Detriot Pistons, the Drive’s parent club, in the 2016 draft. Hilliard was selected in the second round of the 2015 draft after a standout four-year career at Villanova. All three players finished in double figures,and seven Grand Rapids players in total had more than 10 points. Delaware had five players cross the 10-point threshold. Dionte Christmas had 19, Devondrick Walker racked up 15 and Brandon Triche finished with 13 off the bench. Next up, the 87ers hit the road to take on the Maine Red Claws on Thursday, Feb. 2 at 7 p.m. ET. 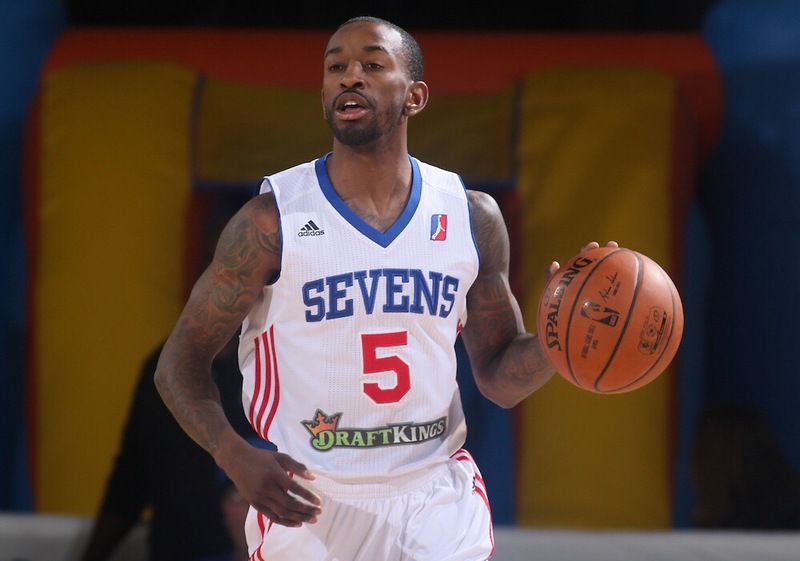 WILMINGTON, DE – JANUARY 20, 2017 – The Delaware 87ers today announced that the team has reacquired guard Russ Smith. He will be active for the Sevens’ NBA D-League Showcase game today against the Greensboro Swarm at 3 p.m. ET. Delaware 87ers Guard RUSS SMITH (5) dribble the ball up court in the first half of a NBA D-league regular season basketball game between the Delaware 87ers and the Maine Red Claws Friday, Feb. 19, 2016 at The Bob Carpenter Sports Convocation Center in Newark, DEL. Smith (6-0, 165) last played for the Sevens in the 2015-16 season, when he averaged 28 points, five rebounds, eight assists and two steals per game in 21 games. He holds the team’s single-game scoring record with 65 points.